Mapping our Watershed Through Art! False Creek Watershed Society partnered with artist Robi Smith to offer a series of Mapping Workshops with the intent to create a map of nature in the Strathcona community. East Vancouver’s Strathcona Neighbourhood is part of the False Creek Watershed. In Strathcona, all precipitation flows into False Creek. A long time ago, when streams flowed through Strathcona, these also drained into False Creek. The purpose of the project was to connect the Strathcona community with nature through art and to build understanding of how our watershed works. We also invited people who don’t live in the area to share their love of the natural world that resides there. When you think about nature in Strathcona, (if you live there or not!) what’s the first thing that comes to mind? A particular tree – newly planted or old growth? A patch of colourful flowers that is alive with bees in summer? A group of native plants, or a weed patch? Maybe its the sensory experiences of water rushing alongside the curb during a heavy rain, patterns of leaves on the grass, wind rushing through trees or lyrical birdsongs? How about your middle of the night dreams of salmon who used to inhabit the creeks? Could it be the local animals big and small – coyotes, eagles, crows, pigeons, seagulls, songbirds and insects? Or maybe the raccoons sneaking into your compost bin at night? Even though Strathcona is an old neighbourhood in the centre of our city, it’s filled with nature. The flora and fauna which lives among us are an important part of our community which provide us with an important connection to a wilder world. You’re invited to share your favourite sightings, memories, and natural places on an art map that your neighbours and other Strathcona nature lovers are creating in collaboration with visual artist (and neighbour),Robi Smith. We live in the city of Vancouver with almost a million other residents. We are blessed to be surrounded by mountains, forests, oceans and rivers. But how much do we know about nature in our own backyard? The Earth and the natural world is present everywhere – from the arboretum of Queen Elizabeth Park, to the buildings of downtown Vancouver, to our last wild salmon stream, to the farm flats of Southlands and it even applies to human economic theory! Please join us for this exciting series of walks this summer and fall. The leaders are amazingly knowledgeable in their specialties - so come along to listen to their words, connect with the land and ask lots of questions! “Rocks, Reservoirs and Rainforest - a Historical Walk Around Little Mountain" with Celia Brauer. Register here for "Earthwalks1 - LittleMountain"
“St. George’s Street Rainway and street walking tour – with Greta Borick Cunningham. Register here for "Earthwalks2 - StGeorges"
"Geology of Downtown Vancouver" A Tour of Buildings and Monuments with Dave Cook. “Economics in Place and Time” False Creek Seawall with Michael Barkusky. “Deconstructing False Creek through Nature's touch” with Pamela Zevit. “Still Creek - Lost” with Bruce Macdonald. Register here for "Earthwalks6 -StillLost"
“Still Creek - Found" with Bruce Macdonald. Register here for "Earthwalks7 -StillFound"
Register here for "Earthwalks8 -Musqueam"
Register here for "Earthwalks9 -RoundaboutKits"
Register here for "Earthwalks11 -Salmon"
"Healthy waters mean for us all". group tables and a very engaged audience. Here are the list of speakers and the Powerpoints that some shared. (see links above) City of Vancouver Greenest City, City of Vancouver - Sewers and Water, St. George's Blueway, Wilderness Committee, Georgia Strait Alliance, Roundhouse Community Centre, Village Vancouver, North Shore Wetland Partners, City Studio, Gibby's Field. The Long Table from City Studio for bringing "The Long Table"! From March 2010 - March 2011 we brought together a Community Mapping Project in the False Creek Watershed. 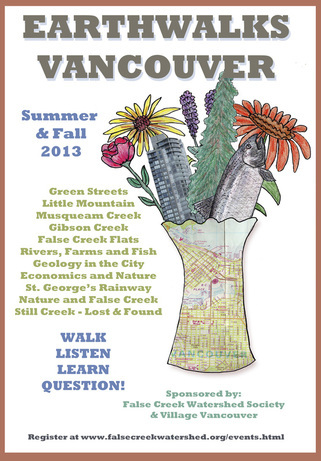 From 2009 - 2011 we offered Lost Sreams walks every September to celebrate Wild Salmon Month in Vancouver. 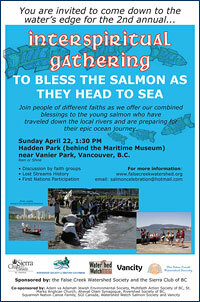 "The Salmon Celebration -Remembering Our History, Celebrating the Living" was a BC Rivers Day event that we created and produced from 2004 - 2009. It grew from a startout audience of 400 to well over a thousand participants annually and it also supported other events such as craft workshops, community tables and Lost Streams walks. The event showcased local artists and performers, featured First Nations groups and individuals and provided a venue for Environmental groups who were working on salmon issues to discuss their work with the public. All-in-all, it was a fun and informative event in the context of BC Rivers Day and over the years thousands of people locally were exposed to the very important discussions of Lost Streams history and the state of salmon today. 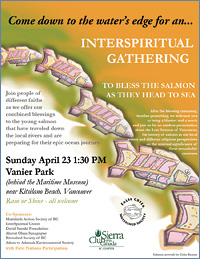 From 2006-2008 the False Creek Watershed Society created the 3 consequtive events - Interspiritual Salmon Blessing for Earth Day. We offered discussions by local faith leaders, education on the Lost Streams of Vancouver and First Nations participation. And most important, we invited the community to come down to the water's edge to offer a blessing to the millions of juvenile salmon who are starting their epic ocean journey. In 2005, there was a request put out by Alexandra Morton, a prominent biologist who works on the West Coast of Vancouver Island and is very concerned about the serious effects of fish farming on wild salmon. She asked that we offer our concern for the fate of our salmon by heading down to a local waterway and gathering with community members to offer blessings to these very young creatures as they head out to their life at sea. For 2006, two organizations – the False Creek Watershed Society, and the Sierra Club of Canada BC Chapter, joined together to expand on this idea.